Out of the many incredible artefacts that have been recovered from sites in Iraq where flourishing Sumerian cities once stood, few have been more intriguing than the Sumerian King List, an ancient manuscript originally recorded in the Sumerian language, listing kings of Sumer (ancient southern Iraq) from Sumerian and neighbouring dynasties, their supposed reign lengths, and the locations of "official" kingship. What makes this artefact so unique is the fact that the list blends apparently mythical pre-dynastic rulers with historical rulers who are known to have existed. The first fragment of this rare and unique text, a 4,000-year-old cuneiform tablet, was found in the early 1900s by German-American scholar Hermann Hilprecht at the site of ancient Nippur and published in 1906. Since Hilprecht’s discovery, at least 18 other exemplars of the king’s list have been found, most of them dating from the second half of the Isin dynasty (c. 2017-1794 BCE.). No two of these documents are identical. However, there is enough common material in all versions of the list to make it clear that they are derived from a single, "ideal" account of Sumerian history. Among all the examples of the Sumerian King List, the Weld-Blundell prism in the Ashmolean Museum cuneiform collection in Oxford represents the most extensive version as well as the most complete copy of the King List. The 8-inch-high prism contains four sides with two columns on each side. It is believed that it originally had a wooden spindle going through its centre so that it could be rotated and read on all four sides. It lists rulers from the antediluvian (“before the flood”) dynasties to the fourteenth ruler of the Isin dynasty (ca. 1763–1753 BC). The list is of immense value because it reflects very old traditions while at the same time providing an important chronological framework relating to the different periods of kingship in Sumeria, and even demonstrates remarkable parallels to accounts in Genesis. The ancient civilisation of Sumer. Sumer (sometimes called Sumeria), is the site of the earliest known civilization, located in the southernmost part of Mesopotamia between the Tigris and the Euphrates rivers, in the area that later became Babylonia and is now southern Iraq from around Baghdad to the Persian Gulf. By the 3rd millennium BC, Sumer was the site of at least twelve separate city states: Kish, Erech, Ur,Sippar, Akshak, Larak, Nippur, Adab, Umma, Lagash, Bad-tibira, and Larsa. Each of these states comprised a walled city and its surrounding villages and land, and each worshiped its own deity, whose temple was the central structure of the city. Political power originally belonged to the citizens, but, as rivalry between the various city-states increased, each adopted the institution of kingship. 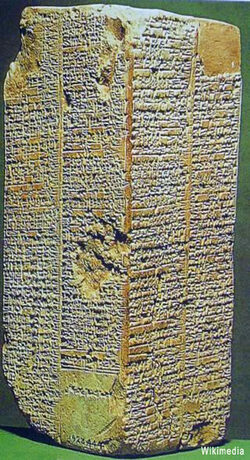 The Sumerian King List, records that eight kings reigned before a great flood. After the Flood, various city-states and their dynasties of kings temporarily gained power over the others. After the kingship descended from heaven, the kingship was in Eridug. In Eridug, Alulim became king; he ruled for 28800 years. Alaljar ruled for 36000 years. 2 kings; they ruled for 64800 years. Some of the rulers mentioned in the early list, such as Etana, Lugal-banda and Gilgamesh, are mythical or legendary figures whose heroic feats are subjects of a series of Sumerian and Babylonian narrative compositions. The early list names eight kings with a total of 241,200 years from the time when kingship “descended from heaven” to the time when "the Flood" swept over the land and once more "the kingship was lowered from heaven" after the Flood. The amazingly long tenure of the early kings has provoked many attempts at interpretation. At one extreme is the complete dismissal of the astronomically large figures as “completely artificial” and the view that they are unworthy of serious consideration. At the other extreme, is the belief that the numbers have a basis in reality and that the early kings were indeed gods who were capable of living much longer than humans. In between the two extremes is the hypothesis that the figures represent relative power, triumph or importance. For example, in ancient Egypt, the phrase “he died aged 110” referred to someone who lived life to the full and who offered an important contribution to society. In the same way, the extremely long periods of reign of the early kings may represent how incredibly important they were perceived as being in the eyes of the people. This doesn’t explain, however, why the periods of tenure later switched to realistic time periods. Related to this perspective is the belief that although the early kings are historically unattested, this does not preclude their possible correspondence with historical rulers who were later mythicised. Finally, some scholars have sought to explain the figures through a mathematical investigation and interpretation (e.g. Harrison, 1993). The Sumerian King List provides a list of eight kings (some versions have 10) who reigned for long periods of time before the flood, ranging from 18,600 to 43,200 years. This is similar to Genesis 5, where the generations from Creation to the Flood are recorded. Interestingly, between Adam and Noah there are eight generations, just as there are eight kings between the beginning of kingship and the flood in the Sumerian King List. After the flood, the King List records kings who ruled for much shorter periods of time. Thus, the Sumerian King List not only documents a great flood early in man’s history, but it also reflects the same pattern of decreasing longevity as found in the Bible - men had extremely long life spans before the flood and much shorter life spans following the flood (Wood, 2003). The Sumerian King List truly is a perplexing mystery. Why would the Sumerians combine mythical rulers with actual historical rulers in one document? Why are there so many similarities with Genesis? Why were ancient kings described as ruling for thousands of years? These are just some of the questions that still remain unanswered after more than a century of research… (By April Holloway).